After reading TFL's excellent CoC 'Talking Tactics' posts on their blog (I just love the level of research and thought that's gone into these rules) I thought I'd try putting theory into practice in IABSM with a small game involving a US Infantry company versus a heavily-reduced German Grenadier company, both sides with plenty of leaders. After probing forward with Blinds (not really got the hang of these yet), my US #1 platoon is advancing up the bocage hedge in the middle of the table. The German 2/2 squad behind the bocage hedge bottom left has just opened fire and caused some casualties. In addition, the German MMG and Company HQ, top right, has opened fire on the squad as it crosses the field behind the house causing a few more dead. The US #2 platoon has moved up behind the bocage bottom-right, and is ready to open fire on the German 2/2 squad in the orchard. 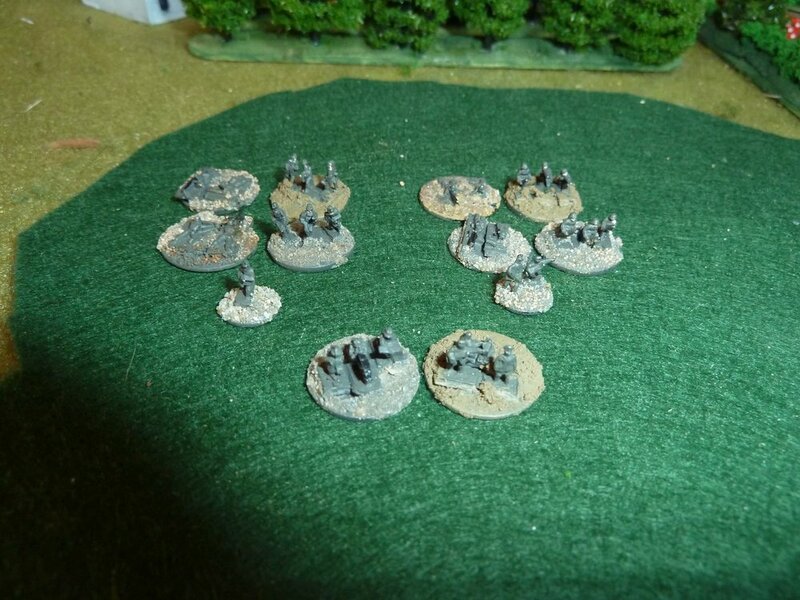 The #1 and #2 US platoons over-power the German 2/2 squad in the orchard, which retires (well, the one remaining man). Their leader, runs off to try and find another squad to command. The US #1 platoon moves up to their position. The US #3 platoon deploys around the house and bocage hedge to the left, but starts taking casualties from the MMG on the hill (top left) and the squads across the lane. The US #1 platoon moves into the orchard and starts to out flank the German position. The #2 platoon moves up through the centre into the small orchard. The #3 platoon in the centre is still getting hammered by deadly fire from the MMG on the hill (just inside close range for the MMG). There is a US MMG in the upper story of the house attempting to provide support, but it is just outside close range and the bocage is providing just too much cover for the German MMG and Company HQ. The Americans have managed to get some kills/Shock on the MMG, but are now trading close range fire with the German 1/2 and 1/1 squads across the track going North: both behind bocage hedges. US #1 platoon has moved through the orchard and takes position along the bocage hedge and blasts the German 1/2 squad...unfortunately taking position behind an ordinary hedge ('okay shot' cover) rather than a bocage hedge ('poor shot' cover). This softer cover means it starts taking casualties from the US platoon lined up along the bocage in an unequal fire-fight at close range. I decide to add a mortar strike for the US to get things moving. It lands spot on target and wipes out the MMG! If it was the Brits, I'd try some 2" smoke! The US #1 platoon fires again and almost wipes out the German 2/1 squad in the hedge! The yellow dot on the house is supposed to remind me that I have a unit (the US MMG) inside - not sure if that works yet. Still not sure how to represent units inside buildings. I did think about having building templates off the board to place them on...or just play with everything damaged until I can find/make some where the roofs come off! The remaining close range firepower of the nearly bigger and more resilient US platoons (still have three Actions after two dead) is too much for the battered German squads and they start to take lots of Shock and with few leaders they can't remove it. Their few remaining troops start to break and run. Close range fire is really deadly even across bocage hedges from units firing with 3/4 actions! MMGs are lethal at close range (although I did beef the German MMG up a little) with good leaders. To suppress a well placed MMG you need artillery or tanks or just try and go around it. Without lots of leaders, squads just can't recover Shock and are ground down. Fire from higher elevation gets an additional dice (so the MMG got 5D6 plus +3 for the Company Commander). Even versus a target in bocage or a stone building, it's deadly. Not sure if its OTT? How much cover would a bocage hedge give to an MMG fired from a hill at 150m? Especially if it has the company command over-seeing firing? Thoughts? Also artillery gets a one column shift if it lands behind a linear obstacle, like a hedge or bocage. I have played with the ranges, so using 1/500 (20mm = 10m) (my table is only 2' x 3') and will try 1/400 (I think 1" = 10m) next time which works. I find the IABSM default 12" = 80yds very odd. My quick ref sheet has everything in meters. Movement is still 1 pip per cm. Cross a bocage hedge is -3D6. Also, I might add some markers to the table to assist understanding in batreps...or do too many markers 'spoil' the report? I know Mark Luther's masterpieces use toned down markers. No close assaults ... firepower did all the damage. I'm still not sure how to sequence them, given that jumping out from behind a bocage hedge, crossing a road and over another hedge puts you at a massive disadvantage in CC. Didn't think about it, but does IABSM have smoke grenades? Might have helped.